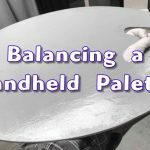 Want to use a wooden, handheld painting palette like a pro but not sure where to start? In this free painting demonstration I’ll show you how to prepare your brand new wooden palette or restore your old painter’s palette. • Some simple steps and some inexpensive supplies will help create the ultimate painting palette. The Best part is you get such a quality painting surface for so little cost. Prepping your palette is really easy to do and costs such a small amount of money you’ll be glad you did. • What are you waiting for? Prep that wooden painter’s palette like a real professional and leave me a comment below! I just bought this relatively inexpensive palette and it doesn’t appear that the manufacturer sealed it very good, I can still feel the wood grain. 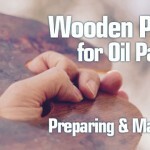 I’m going to show you today how I would seal up the wood and get it ready for painting. I’ve laid the wooden palette out here on a comfortable flat surface and I’m going to be working some linseed oil into the palette. 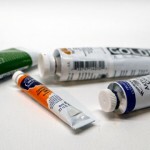 Don’t worry about using any fancy, artistic linseed oil, save that for your paintings. You can just use the regular, inexpensive, boiled linseed oil from a hardware store. Instead of using an old shirt or a cheap rag I actually like to go one extra step and use a lint free rag, these are the types of rags you buy for cleaning glass. I think it’s well worth the extra pennies. I actually restore a lot of old hand tools using this same method. Okay, I’m not going to put a real heavy coat on, I would get a much better result if I wipe off any excess linseed oil that I’ve added and then just let this dry overnight and then I can add another layer or two. You’ll be much better off if you add a few thin layers rather than trying to add one heavy layer. As you can see there’s no pools, there’s not an excessive amount here. So we’ll let this dry and we’ll come back to it later. Here I am about a week later. I ended up adding three coats to this palette using the linseed oil and I let each coat dry overnight and then I gave it a very light sanding with the grain with 400 grit sandpaper and then I let that last layer of linseed oil dry for several days. This palette looks and feels great. I can’t feel any of the woodgrain. I can’t wait to put some paint on this and use it. Don’t forget to go over to helloartsy.com, I’ve got tons of free resources, articles about learning how to draw and paint and everything is 100% free!